In which The Gay Recluse watches plants. 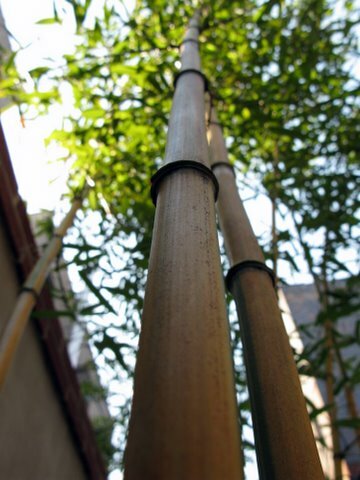 With a nasty apartment building looming over our garden, we felt we had no choice but to plant bamboo, and not the clumping variety either, but the running kind you read about taking over the earth. We rented a truck last summer and drove to a small town in New Jersey where we bought a special cold-hardy variety with yellow culms (that’s the technical word for “stalks”) and bright green leaves. We planted it in an elevated trough bounded on all sides by at least 8 inches of concrete block. It looked great! Now it’s spring and we’re waiting for the new growth. Supposedly the new culms will grow to full height — which for our variety is like 800 feet tall — in just sixty days. Whatever happens, it’s going to fun to watch. Will we regret buying the running bamboo? Let’s hope not. Hello, baby shoots! We’re very happy to see you! 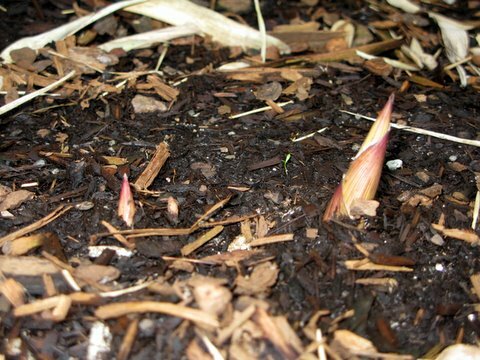 According to our research, those baby shoots will be 800 foot-tall culms within 60 days. The hope is that if we get enough of them, we won’t even be able to see the apartment building behind us. Remember the scene in Crouching Tiger, Hidden Dragon? That’s going to be our backyard in a few months! (Location scouts, are you li$tening?) We can hardly wait.